A few months ago, Rep. Mike Rogers (R-Mich.) announced he would leave the House after the current session to host a radio talk show. But what about a talk host running for Congress? In a Tuesday piece, Salon’s Jim Newell wondered about the possibility that conservative talkers such as Laura Ingraham would take the plunge. So what’s it going to be? Ingraham/Brat ’16? Ingraham/Santelli ’16? 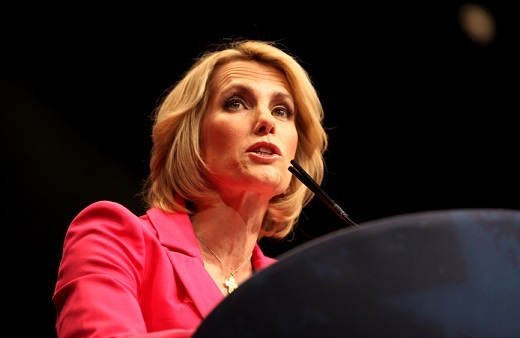 Ingraham/Cruz ’16? CRUZ/SANTELLI/INGRAHAM/BRAT/COULTER ’16 — like a sort of Politburo-type ticket thing?? Let’s not get ahead of ourselves — Ingraham is still a couple of cycles away from the Oval Office. But it’s worth considering when these radio talkers, who command extraordinary audiences every day, will cease to be just talkers and take the plunge into a House or Senate race. Talk radio and other conservative media outlets used to serve as the rightward pole in a race, pulling Republican candidates in their direction, but never necessarily all the way. But given the rightward lunge of the Republican Party over the last few years, the gap has been closed: There’s no air between Laura Ingraham/Mark Levin/Rush Limbaugh and the right-flank candidates challenging incumbents for office. Since the crazies are running the show, why not have their most famous delegates finally slot their names onto ballots? In any House or Senate seat that’s in an even marginally competitive district or state, though, it gets tougher. Oh, sure, she could still push her way through a Republican primary. In a general election, though, that’s where the big problem comes into play: decades and decades of hateful comments directed at more or less every person and demographic. The opposition research would be as simple as a Google search. It could start with her college years, where she spewed “the most extreme antihomosexual views imaginable” for the Dartmouth Review, run through that entire book she wrote of fake racist Obama diary entries, end with her current xenophobic spree, and the hundreds of thousands of odious episodes in between. But there’s little reason for Ingraham or her right-wing media ilk, even after they’ve brought the Republican Party down to their level, to bother with a House or Senate race. It would be an extraordinary pay cut. And it would also be a significant reduction of power. Congresswoman Laura Ingraham or Sen. Laura Ingraham would possess about .00001 percent of the power she currently holds. She has a direct line to millions of people a day and can speak freely. She clearly has no interest in passing legislation, only stopping legislation through demagoguery, and serving — serving, ugh, even that word! — as a backbencher buried in the House Subcommittee on Capitol Janitorial Pensions meetings would be a real distraction from the important business of riling up crazy people about Mexicans.